Thank you to head Soccer coach, Meghan Keoughan, to our Hockey head coach, Brian Casey, our head coach of Boys’ Soccer, Sven Dietrich, and our head coach of Girls’ Hockey, Isabelle Germain, for the continued support of our programme. In so many ways we are the UNited KES team of athletics. A special thank you to our Athletic Director, Kim Walsh, for all his support and patience (One day, Kim, I’ll get better at picking up banners - pinkie finger promise!). We want every child to find an activity he or she can pursue with passion. With three seasons of sports and over 25 different options to choose from, we are pretty sure your child will find a few to love. 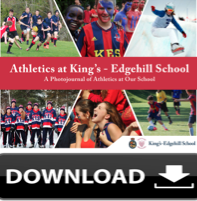 Download our Athletics Photojournal .